WITH a good submarine, a navy can do amazing things. Ask the French. 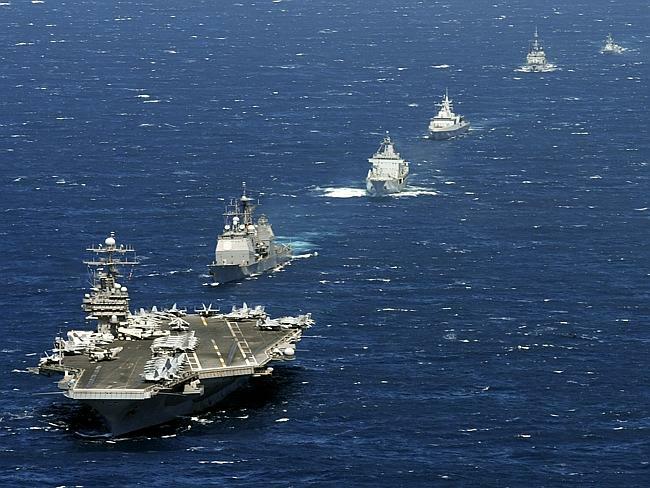 They’ve just managed to “sink” a nuclear-powered US super carrier — and half its battle group. The French Ministry of Defence has revealed one of its attack submarines pulled off an astounding upset during recent war-games in the North Atlantic. The Aviationist blog spotted an article on the French defence force’s website — quickly withdrawn — which told how one of their submarines, the “Saphir” tackled the might of the United States’ navy off the coast of Florida. At the core of the surface force was the enormous aircraft carrier USS Theodore Roosevelt and its powerful strike wing of 90 combat aircraft and helicopters. Clustered protectively about it was several advanced cruisers and destroyers, and its own guardian submarine. In one element of the war games, the Saphir was tasked with the role of being the “bad guy”. It’s mission: To seek, locate and exterminate the US naval force.